I am so excited I found yet another gem in the San Gabriel Valley. Even though I can't say I've tried everything or gone five times, I feel good giving it a solid endorsement because it hit the spot in such a big way. I had read much about the fine Muslim Chinese food haunts and finally made my way to China Islamic in Rosemead. 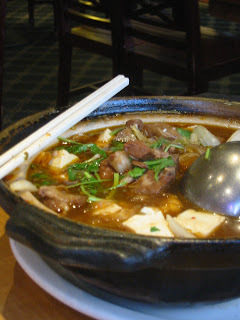 The lamb hot pot (called Lamb Stew Warm Pot -- we got the small size) was excellent, as was the sesame green onion bread. There were a good number of lamb dishes, not surprisingly, and I went with what was most recommended on message boards. Our waiter told us the hot pot would take 20 minutes (made fresh to order!) and we were in no hurry. The best part about the hotpot was the ultra-tender, fall-off-the-bone chunks of lamb that were so incredibly succulent that two of us had no trouble totaling all the bone-in pieces of lamb in the pot. And it was a big pot. The silky pieces of tofu, vegetables and glass noodles harmonized with the aromatic herbs and spices that went into the hotpot made it such a pleasure to slurp and dunk the bread in that we surprised ourselves by barely leaving any juices in the pot. I detected some nutmeg and cumin, but the most pronounced flavor that distinguished this dish from other hot pots was aniseed, which has a slightly liquorice-like undertone. I think there were fresh sprigs of cilantro topped on the soup that gave it a very refreshing finish. Now for the bread. You can get thick or thin sesame green onion bread and I opted for the thick one because I thought that would be more authentic. And thick it was -- a bit too much so for me. 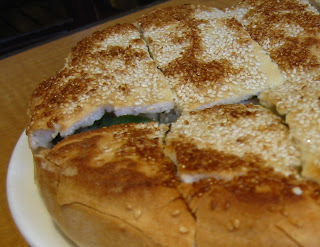 But the crust was perfectly crispy sprinkled with toasted sesame seeds and the dough had chopped green onions integrated into it. It was good by itself and did a decent job of soaking up the juices in the pot. I would probably get the thin bread next time, which looked more manageable. I'm just not a huge fan of overly doughy breads. My only Muslim Chinese food experience prior to this was in Xian after visiting a mosque nearby. We were obsessed with trying local places that wouldn't be touristy, and were directed to a hole-in-the-wall that served only one thing -- soup with soaked pieces of bread torn by the eater. I don't remember what it was called but do recall loving it despite the laborious task of tearing the bread into very small pieces. When my lazy ways prompted me to tear bigger chunks into the soup, the local patron we were sharing a table with gestured to produce smaller chunks -- much smaller chunks. I complied. It was worth it. Back to China Islamic, we also had the Shredded Chicken with Bean Sprouts and Dried Bean Curd that was a stir-fry with vegetables. It was bland; I wouldn't recommend it. The restaurant was initially empty on a weekday but later got a bit noisier with kids frantically running around as more families occupied large round tables with lazy susans. I will definitely return to sample more. sounds tasty and different from any chinese food i've had before. i wonder if the food has more of a central asian influence? Where's the recipe for the lamb stew? Those photos make me hungry! I LOVE onion bread! There's a place in Torrance -- Beijing Islamic... I wonder if its still there? Unfortunately, Beijing Islamic seems to be closed, but if you're down in O.C., the owners of the old Tung Lai Shun opened their new restaurant in Anaheim. Check it out and let us know how it is! This has to be one of the oldest and best Chinese/Islamic food in Southern California. It's been around since the early 80's and has maintained its authenticity and taste ever since. 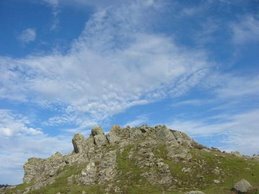 Reading your blog reminds me of how good the place is and it's been too long since I have been there. It's time for another visit! Can you say fall-off-the-bone in Afghan?